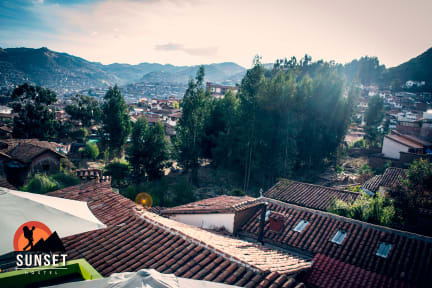 Sunset House Hostel i Cusco, Peru : Boka nu! 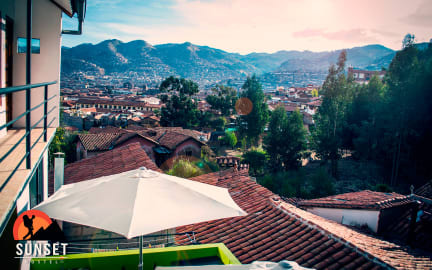 Sunset House Hostel is an exclusive little hostel located on the historic center of the city of Cuzco; very close to the Plaza de Armas in the traditional, cultural and artistic neighborhood call San Blas, offering top quality affordable accommodation. No matter what you book for, a share or private room, you can rest assured that your stay with us will be one of exceptional comfort experience. San Blas is an exceptional location, close to all the touristic places like the stone of the 12 angles, museums, art galleries, ruins, etc. It is also close to the night life if you want to go out to our energetic bars, listen to live music, eat at amazing restaurants suitable for different types of taste, or if you would like to simply take a walk on the streets. You will enjoy the energy of a very magical place. There are two smoking sun terraces, access to the kitchen and cable TV and two bathrooms for the common areas. This property has a 2 day cancellation policy. Failure to cancel within this time will result in a cancellation charge equal to the first night of your stay. The charge for No Show will be the full reservation rate. A soulful warm place with an sensation that you're living inside the hill on which groovy tanda pata culture distrikt recides.